Tony Blair says a new force will tackle the "brutal and sophisticated" criminal gangs of the 21st Century. The Serious Organised Crime Agency, dubbed Britain's FBI, will bring together more than 4,000 police, customs and immigration experts. Soca "law enforcement officers", with new multiple powers, will target international drug and people traffickers and fraudsters. 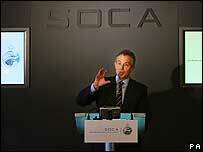 They would make life "hell" for "Mr Bigs", Mr Blair said at Soca's launch. "The level of sophistication, the level, frankly, of brutality with which many of these gangs operate today means that we have to do it differently," Mr Blair said at the Downing Street launch. Soca amalgamates the National Crime Squad, the National Criminal Intelligence Service (NCIS), and investigators from Customs and the Home Office's Immigration Service. A major part of its role is to "reduce harm" to members of the public which will be measured by thing like falls in robberies or the number of addicts in treatment. Initially, it also aims to build up more comprehensive intelligence on organised crime networks operating in the UK. The prime minister pledged to monitor the agency's progress and, if necessary, introduce further powers. "There is absolutely nothing, in my view, that should come before the basic liberties of people in this country to be freed from the tyranny of this type of organised crime." It was time to "stop trying to fight 21st Century crime by early 20th Century methods," he added. Soca bosses say partnership with the private sector will be crucial in tackling computer crime, illegitimate businesses and high-tech fraud. Director general Bill Hughes told the launch: "There's no point in letting people be victims of crime when they could be avoided and it's no good letting them have information which could help us... if we're not able to get hold of it." Speaking afterwards, Home Secretary Charles Clarke said Soca marked a "step change" in the government's efforts to fight organised crime, which costs the UK an estimated £20bn a year. According to figures on the Home Office website, there are around 400 major crime bosses in the UK, with an amassed criminal wealth of approximately £440m. The new agency will use international agencies to identify links between illegal gangs in the UK and abroad with about 120 officers, based in 40 countries around the world, working as liaison officers. The agency will start with 4,200 staff - about half criminal investigators and half analysis and intelligence - and a budget of £400m. According to the Soca annual plan, published on Monday, the agency aims to spend 40% of its operational effort on drug trafficking, 25% on organised immigration crime, 10% on fraud and 15% on other organised crime. Although it is now officially going "live", Soca has been operating as a shadow body for the past year. Michael Levi, a professor of criminology at Cardiff University, told BBC News the creation of Soca had become necessary because of the rise in "international crimes" including people-trafficking and drug-smuggling. "Britain, along with Belgium and Germany, has about the most decentralised system in the EU and so this represents a top-slicing of the policing function," he said. Nick Herbert, Conservative spokesman on police reform, welcomed the launch but told BBC News that "national policing" should not be introduced at the expense of community policing. "It is important that locally police forces remain accountable and in touch with their local communities," he said. And Drugscope chief executive Martin Barnes told BBC News that, while disrupting "high level markets" was a good move, "low level dealers" must also be targeted. "We welcome the launch today but time will tell how effective it is in terms of affecting the price and availability of drugs on the street," he said.